Where do you start when everything is so good. It's like where do you stop when you are chasing your tail. It all just swirls around and you keep going. Thats what the last week felt like. I met a dog called Molly who has a hoody made into a dog coat. It's actually cooler than mine. I will ask Dad for one. I stayed with Nel and Jamie and their boys, Matty & JJ, when Dad was in the National Park and that was good. The littlest boy, Matty, was really excited and I snapped at him and made him cry. I felt terrible for a long time and Dad didn't think I would be able to stay with them again but I can. I got to go to Hermannsburg again and met the Aboriginals like Mavis and old Hermann and young Gavin. They think I am funny but they tell me to shut up when the car starts and I bark. Especially Hermann because he is old. I love rolling in the red sand out here. It make me look redder like a cattle dog and thats a nice change. The Choir loved me. All of them. I didn't know whether to go to Marianne or Leigh or Roy or Prue or Susan or Janet. It was amazing. I felt like I was floating on warmth. We were just a big pack and they sang really well. Tony really likes me as well. Well everyone does really except a woman called Minnie from last year. But Dad said I couldn't say how much she hated dogs. But she unsubscribed last week and he said we can say anything we like about her now. Dad's like that. Our guide is a country boy called Ben and he said I have to learn boundaries and made me sit outside the kitchen. But I didn't for very long at all and he forgot. 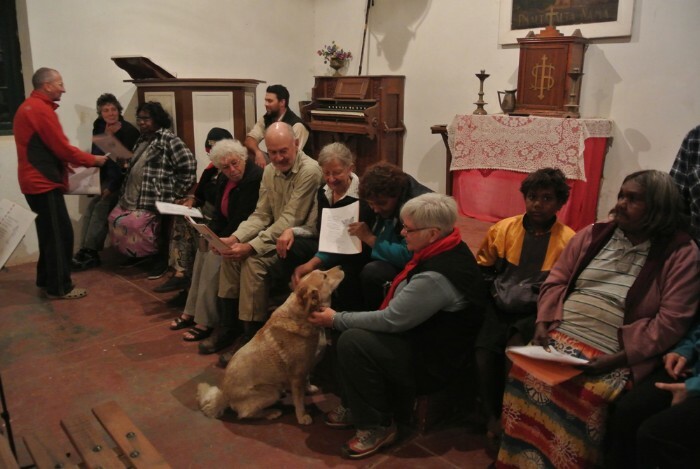 On the last night I sang with the Hermannsburg Choir and went up to Marion who I really like. She looks after me sometimes. Anyway. Next week we are driving to a town called Burra because Dad and I are going to run a singing festival in the best little town in South Australia. We'll tell you about it next week but its going to be huuuuge like a hippopotamus bone although I've never really had one. Anyway. I am going to have a bit of a rest now because its been all go. My dog bed is in the sun and I am going to crash for a while. Well Tommie - you must be exhausted. So much action in such a short time. The hoody looks cool but I think your is terrifically smart and to be honest, more practical but if you really want a hoodie I'm sure your dad will come up trumps (he hasn't disappointed you so far, in fact pretty much spoiled you I think!!). I've met Mavis (quite a lady) and also the young mums Marion and Marianne but none of them would remember me I'm sure. But Hermannsburg is such a pretty place... ah I had such plans and dreams. One day when we meet I'll tell you about it - would make Hermannsburg/Ntaria THE place in Australia to visit. Glad you joined in with the choir and contributed your unique vocal qualities no doubt! As to boundaries... well there are occasions when they are essential but I'm sure your inner-dog will guide you and I'm sure that many dont mind 'boundaries' being flexible here and there. As to Minnie, well if she can't appreciate a well travelled and personality-plus travel companion such as yourself then it's her loss... don't look back!I look forward to hearing about Burra and the singing festival - give it full throttle Tommie and don't hold back. Say hi to your dad from me and happy travels... cheers H.
a few good old cornish songs at Burra? ?